We appreciate how hard Canada tries to do things; truly, we do. We know that internationally, everyone’s all, “O Canada! Why you lookin’ so plaid today? Let’s put maple syrup on a log and eat it with a woodchuck! What a hearty breakfast.” No wonder they have hangups about their prominence in the international food world. But Canada has a rich culinary tradition, far beyond poutine! 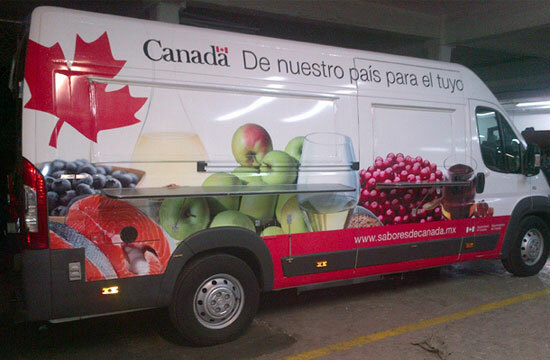 Which is why we applaud the Canadian Government’s latest initiative to change everyone’s mind about Canadian cuisine: sending a food truck to Mexico and serving them poutine. The new Canada-branded, taxpayer-funded venture, which kicked off its three-week pilot project last week, is serving up a Mexican-ized version of poutine, using Oaxaca cheese instead of curds. Also on the menu are Alberta beef tourtière (beef pie), and maple-glazed Albacore tuna. He added that the cuisine of the geographically enormous Canada is more regionally-based, anyways, and to unify all of the country’s cuisine as “Canadian” would be impossible. Hence, Mexican French fries = Canada, according to Canada’s adorable logic, might not work. In the spirit of Canadians trying too hard, you can read more about the initiative in the very long, very earnest Post article below.